In recognition of Dubai Civil Defence’s commitment to Excellence and Innovation, Chief Fire Officer David Etheridge, President of the British Chief Fire Officers Association (CFOA) and Chief Fire Officer of Oxfordshire Fire and Rescue Service, UK, recently awarded His Excellency Major General Expert Rashid Thani Al Matrooshi, Director General of Dubai Civil Defence, the International Excellence and Innovation Medal at a ceremony in Dubai. Senior officers from Dubai Civil Defence and other UK officers were in attendance. Major General Expert Al Matrooshi is the first Fire Chief outside the UK to receive this Medal which was awarded for the Major General’s strategic vision to upgrade fire services and his distinguished management role at emergency incidents, including the serious Address Hotel fire on New Years Eve 2015. In addressing the presentation ceremony, CFO Etheridge expressed the appreciation of CFOA and UK Fire and Rescue Services, supported by the UK Ministry of International Cooperation, for Dubai Civil Defence showing commitment towards high excellence and innovation standards and applications in the fields of fire suppression, rescue, accident management and implementation of latest technology for Civil Defence personnel. CFO Etheridge said that CFOA and the UK Fire and Rescue Services will work tirelessly to enhance their cooperation and coordination with Dubai Civil Defence, to embed the concepts and application of excellence in Fire and Rescue teams performance in Dubai, and share an exchange of information and expertise and sustained programme of joint work with other countries for the mutual benefit of all sides. Following presentation of the award, Major General Expert Al Matrooshi responded by saying that the Department of Dubai Civil Defence is always keen and committed to participate in all conferences and forums focusing on innovations, whether relating to services, operations, policies, systems or technologies. Major General Expert Al Matrooshi concluded his address by stating that from this platform, we are inviting all of you and the other members of your Association, and all those who are concerned with fire and rescue sciences and applications to participate in this Fire Safety Innovative Award, and wish success to the UK Forum in Dubai. 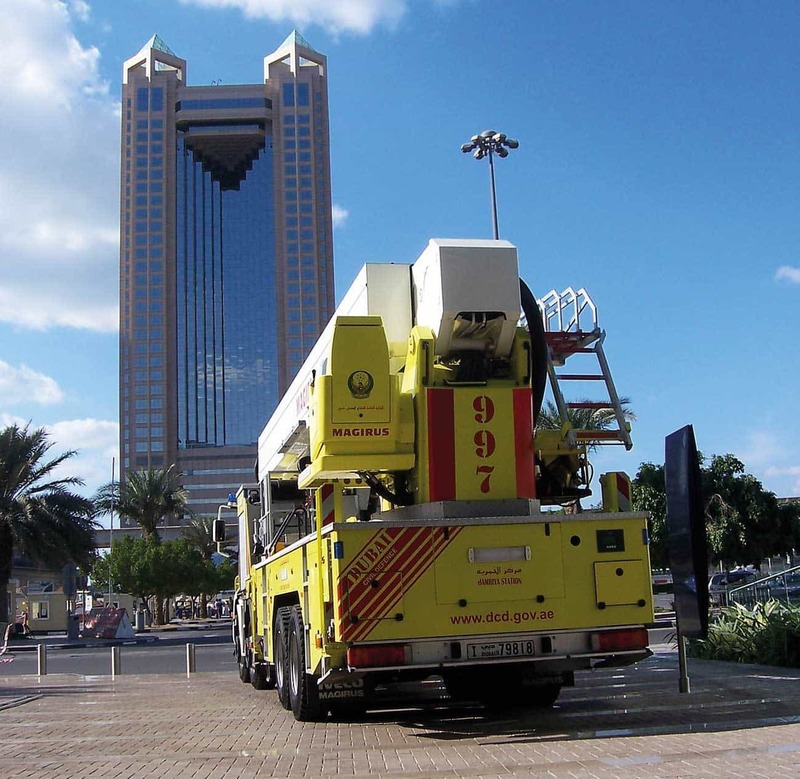 A Dubai Civil Defence 54 metre 8 x 4 Iveco Magirus Aerial Ladder Platform pictured in front of one of Dubai’s iconic high rise towers, the Fairmont Hotel in Sheikh Zayed Road. Major General Expert Al Matrooshi and CFO Etheridge then awarded Washington Hall Fire Training College graduates their Fire Diploma certificates and other appreciation decorations, being the first group of Fire Officers from the Gulf region to receive these awards. Mr. Steve Hamm, Chairman of the Institution of Fire Engineers (IFE) announced that Dubai Civil Defence and its Officers were being awarded Associate Membership of the IFE. He also awarded the Fellowship of the IFE to Colonel Rashid Al Buflaseh, Assistant Director General for Dubai Civil Defence’s role played in the transfer and exchange expertise with other Civil Defence Authorities. Mr. Hamm then announced the opening of the IFE main branch for the Middle East and Gulf region, to be based in Dubai. This was followed by a brief introduction of the IFE’s role and its professional commitment towards Dubai Civil Defence, presented by Mr. Ian Moore, CEO of the UK Fire Industry Association (FIA). Finally a Memorandum of Understanding between Dubai Civil Defence and the UK Chief Fire Officers Association was signed by Major General Expert Al Matrooshi and CFO Etheridge, which addresses technological changes, fire and rescue profession needs and methodologies, future reshaping, meeting innovation and environmental needs. Mr. John Bonney, Chairman of UK National Resilience, who also represents NFPA in UK, was present during the signing ceremony. The three main criteria will be project design and development, project implementation, and project impacts and results.